Elie Anatole Pavil was born in Odessa, Russia in 1873. He came to Paris in 1892. He established himself in Montmartre, on the Rue Caulaincourt. He had arrived at the high point of La Belle Époque; Pavil dedicated himself to capturing its atmosphere on canvas. For most of the next fifty years, he painted the cafes, the beautiful women, the jazz bands and artist ateliers of Paris. His paintings show an intimate knowledge of the inhabitants of the streets and alleys of Montmartre. 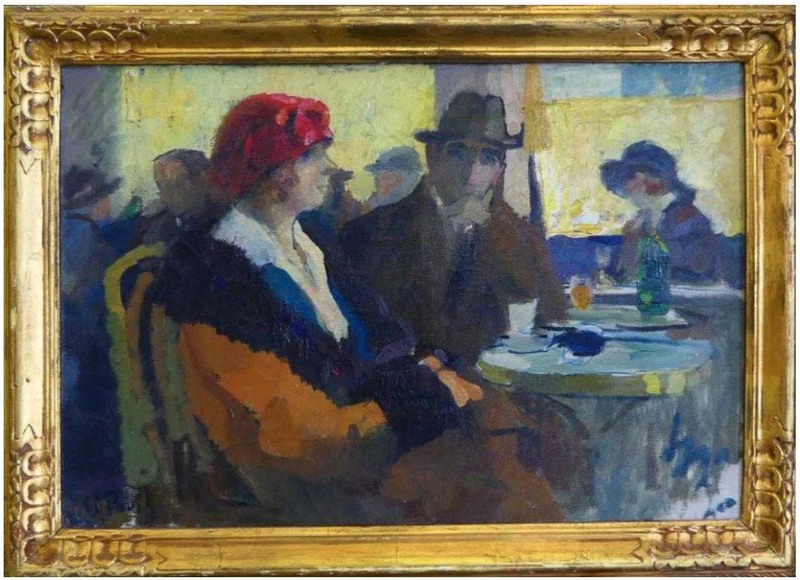 Elegant couples dancing, beautiful models posing, working men finishing their day with a drink at the bar---all were captured in Pavil's carefully balanced compositions, many of which show the distinct the influence of Degas and Renoir. Pavil exhibited at the Salon des Artists Français, Salon des Indépendants, and the Salon d'Automne. He exhibited at Galerie Charpentier, Galerie Georges Petit, and Galerie Bernheim Jeune. Claude Monet described Pavil's paintings as "little marvels". He was awarded Chevailier de la l'Légion d'Honneur. Pavil also counted Pissaro among his friends. Pavil continued painting with the same passion until the end of his days. He finished his life in Morocco, another place for which he had a lifelong interest. In 1973 Pavil's atelier was sold at auction in Paris more than 200 works that spanned four decades. His works are in the Musée d'Orsay and the Musée Petit Palais in Paris.